From phishing to crypto jacking to key-logger attacks, there are a lot of ways, hackers can steal your stash of cryptocurrency. In early July 2018, Bleeping Computers identified a suspicious activity to defraud 2.3 Million Bitcoin wallets. All these wallets were under the threat of being hacked. The malware used was “clipboard hijackers.” It operated in the clipboard and could replace the copied wallet data with one of the hackers while transferring Bitcoin to other wallets. Kaspersky Lab had predicted such type of hacking attacks in November 2017, and it didn’t take long to become a reality. Till date, this is one of the most popular types of attack to steal user’s crypto and information. About 20 percent of the total cryptocurrency hacking attempts are made on individual’s wallets and accounts. Kaspersky Lab’s report published in Cointelegraph stated that criminals had stolen $9 million through social media engineering and other hacking techniques. There are many slack bots which are being used by hackers. Since mid-2017, there have been many cases of stolen cryptocurrency through this technique. The bot sends a notification to the user’s device about issues with their wallet. The ultimate goal is to force the user to click the notification and type private key. ‘Botnets’ are networks malware-infected systems which can be controlled remotely. Generally, botnets are used to distribute malware or to perform DDoS attacks. But for quite a few time crypto-criminals are using it to mine cryptocurrency. The bad news is there is no decrease in the activity of crypto hacking. 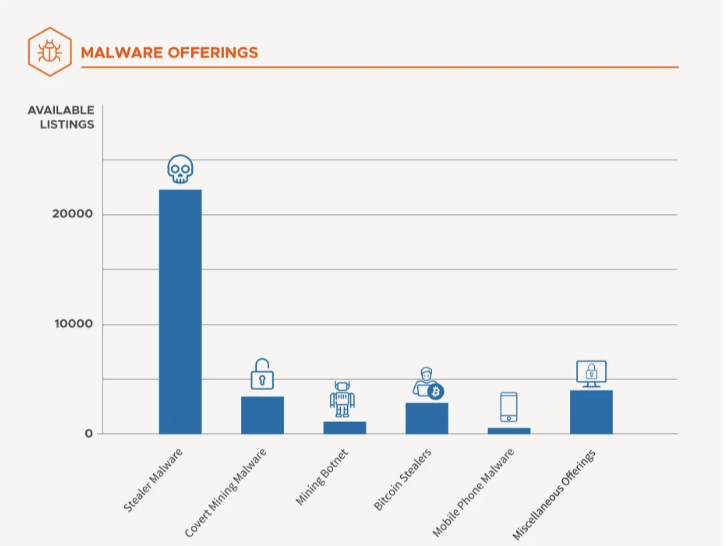 As per JAN 2019, there are more than 11000 dark web platforms selling more than 34000 offers. Here anyone can get malicious software for an average price of $240.